WHY DO THE CROWN AND BRIDGE MARGINS LOOK BAD ? Why do the edge of a bridge look bad? The accurate design of crowns and bridges are elementary in the high quality clinics. However cruel preparation and overhanging edges around the gum can usually destroy the esthetic look of the dental product. Above all, the ordinary metal bridges can not let light into the tooth itself, so the gum at the crown edge will be dark and has a bluish shade. 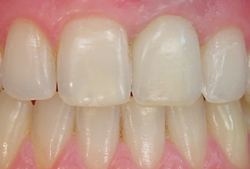 This is why we use at the front teeth mostly the non-metal crowns that meet the higher esthetic requirements. The edge of crowns made with the old preparation procedure push the gum. 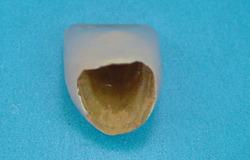 With the modern "stress free shoulder preparation" technique, the crown sits into the shoulder” made in the border of the tooth, so it does not push the gum. 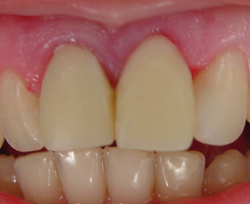 CASE STUDY: How could we repair two upper incisors with inflamed gum? How could we crown a strongly discolored tooth? In the first case you can follow the placement procedure of a non-metal porcelain crown (name of the material: IPS Empress II.). The second patient had a strongly discolored tooth, so we inserted a porcelain crown burnt on a very thin galvano-gold material. It causes a problem in many cases that the dental products made by the ordinary polishing discolor the gum. 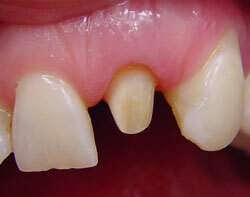 If we choose the appropriate procedure and the right crown type, we can get a much better result. 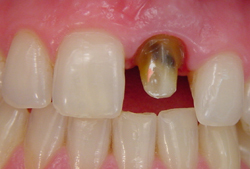 It can be seen that the gum is discolored and strongly inflamed beside the disadvantageous looking crowns. On the left side upper incisor we can see a round shouldering preparation. This is the precondition to save the gum. During work we push away the gum with a blue color fibre to protect from accidental damage might be caused by the drill. The gum is nice slight pink, healthy and the crown is visibly does not push it. 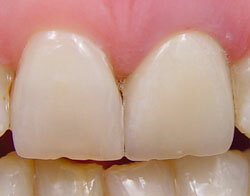 The crowns assimilate well in style with the surrounding teeth. 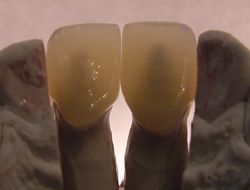 We put the finished crowns on a cast and enlighten them. They were very live and transparent non-metal crowns. 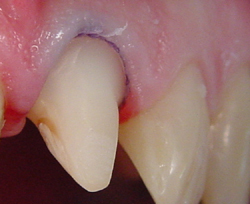 The left upper incisor had root treatment and strongly discolored. We have recovered the gum, so it is nice and slight pink. The inside of the galvano-gold crown was strong, but it was made of a very thin golden layer. The finished crown nicely fit with the surrounding teeth. Because of the circled shouldering preparation it does not push the gum. One of the most challenging tasks for a dentist and the laboratory to supplement the front incisors. Especially when only one of them has to be designed in color and shape. 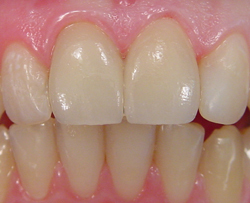 The addition of the left upper incisor can be done only if the gum is nice and not inflamed. We chose the galvanic-golden crown together with the laboratory. 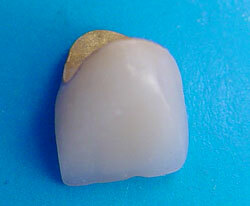 In this crown, the porcelain goes on a very thin golden layer. Comparing to the burnt-on metal crowns, we can get more vivid colors with this galvanic-golden product. The dental product very nicely fits into its environment, does not push the gum, so it will not turn to blue color. The live color can be reached with the concurrent usage of different colors. 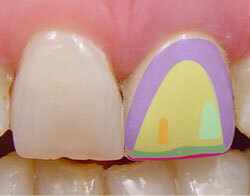 On the picture you can see the color map of the tooth. The upper teeth were in bad condition. After building them up we faced a problem.The patient did not want to have implants, and we had a ruiny tooth at a very important position. In a unique operation we built up the root with glass fiber posts. The bridge was made of gold and porcelain. the gold is one of the best metals as the technician can cast it very precisely. The gold framework is precisely fit on the teeth. The happy smile of our patient.